Home News & Offers Blog Good luck at the London Marathon, Nat! The London Marathon takes place this Sunday 24th April and Nat Vowden, our supervisor at Rick Stein, Sandbanks has been training hard in preparation. Nat is not a newbie to running marathons, he has previously endured half marathons in Bristol and Plymouth and this is his second London Marathon. He’s raising money for Child Bereavement UK, a charity that supports families and educates professionals when a baby or child dies or when a child is facing bereavement. Nat’s family and friends have been affected by child bereavement over the years so he will be hoping to raise a great amount for such a well deserving charity. Nat raised £1,500 for Children’s Hospice South West in 2015 by taking part in the London Marathon and this year is hoping to exceed this amount by raising £2,000 for Child Bereavement UK. 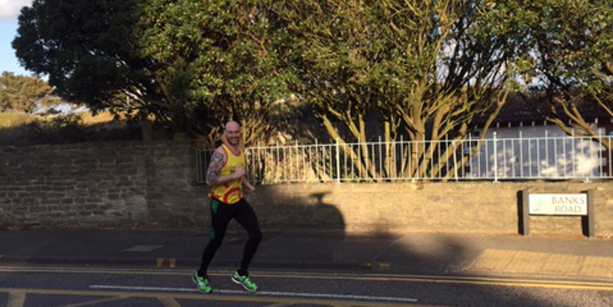 In preparation, Nat has been training for the last 12 months doing an 18 mile run and a 10 mile run each week. He has also been going to the gym four times a week for at least an hour. On the day of the marathon Nat will be wearing his lucky pair of Nike running socks. We’ll be watching out for and supporting Nat on Sunday 24th April.